Sens. 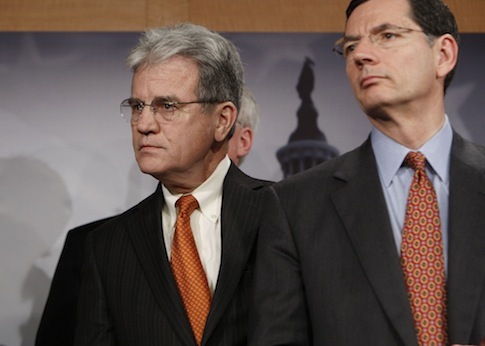 Tom Coburn (R., Okla.) and John Barrasso (R., Wyo.) released a new report Tuesday evening highlighting Obamacare’s failures, including forcing millions of Americans off their health insurance plans and adding $1 trillion in new taxes. The senators, both of whom are physicians, followed up on three previous reports dating back to July 2010 that warned of the dangerous side effects of the health care law. "For millions of Americans, Obamacare itself has become a pre-existing condition that has limited their access to quality, affordable health care," Coburn said in a statement. "As we warned in our previous reports, Obamacare is fundamentally flawed. The law strengthens the hand of government and weakens the hand of doctors and patients. Obamacare is cutting choices, not costs, and costs will likely continue to rise." Coburn and Barrasso predicted in 2010 that millions would lose their health insurance plans. As of January, more than five million Americans have had their insurance cancelled, with 1.1 million notices occurring in California alone. "Despite President Obama and Democrats’ promises that ‘if you like your plan you can keep it,’ more than five million people in 35 states have lost their current health insurance plans due to Obamacare," the senators wrote. The senators said the outcome was "worse than we imagined." "Enforcement of the employer mandate has been delayed, which has pushed back some of the impact the mandate will have on individuals losing their original health insurance plans," they said. Additionally, Coburn and Barrasso predicted the law would bring "skyrocketing" health care costs and trillions in new taxes. The pair cites a report from the American Action Forum that found that insurance premiums are rising in all 50 states by an average of 202 percent. According to Congressional Budget Office (CBO) estimates, Obamacare is also adding $1.058 trillion in new taxes, including $317.7 billion in payroll taxes, a $111.0 billion tax on "Cadillac" high cost plans, and $55 billion for those who do not abide by the individual mandate. Some of Coburn’s and Barrasso’s predictions are still developing since portions of the law have been delayed numerous times. For instance, because the employer mandate was delayed until 2017, its impact on jobs is not yet clear. The senators predicted that the mandate would negatively impact jobs, which was backed up by the CBO estimate that the law will eliminate the equivalent of 2 million jobs. Another "prognosis" that is still developing is the law shifting the uninsured to Medicaid, because not all states have expanded their Medicaid programs. However, last week Sen. Mark Udall (D., Colo.) praised Obamacare for adding to the Medicaid rolls. Democrats continue to argue that Obamacare is "settled law" and only needs tweaking, though Democratic National Committee Chairwoman Debbie Wasserman Schultz is silent on how. However, Coburn and Barrasso said the law’s negative impacts are "not due to minor imperfections in the law." "The impacts of Obamacare were foreseeable and preventable," they said. "Now, President Obama’s administration is scrambling to mitigate these negative consequences through administrative actions and delays. However, the flawed policies within the health care law cannot be fixed through administrative adjustments or delays." Coburn and Barrasso said their report is "not an exhaustive list" of Obamacare failures, but highlights that many of its negative impacts were "anticipated and preventable." "As doctors, we know that Americans should be in charge of their own healthcare decisions—not Washington," Barrasso said. "Over the past four years, we’ve highlighted the negative side effects of the healthcare law for patients, providers and taxpayers. Our new report confirms again exactly how Americans across the country are losing their insurance plan, watching their costs increase, and paying higher taxes." "It’s time to repeal this law and replace it with step by step reform that focuses on care instead of coverage," he said. This entry was posted in Issues and tagged Barack Obama, John Barrasso, Obama Administration, Obamacare, Tom Coburn. Bookmark the permalink.